On Holocaust Remembrance Day on April 12, Sheba Medical Center, Tel Hashomer will hold a ceremony to honor Holocaust survivors. As Israel’s national hospital, and as the only hospital in Israel that provides a special program designed to address the sensitive needs of Israel’s aging Holocaust survivors, Sheba Medical Center is filling a significant gap in treatment to Holocaust survivors. It is both an honor and a duty to remember those who perished in the Holocaust: men, women and children of all ages, amongst them renowned doctors and nurses who tended to the ill throughout Europe. To commemorate Yom HaShoah, Holocaust Remembrance Day, on Thursday, April 12, Sheba Medical Center, Tel Hashomer is inviting all survivors involved in its program to a ceremony to honor survivors and victims of the Holocaust. Sheba Medical Center, Tel Hashomer, offers a special program that caters specifically to the emotional and physical needs of Israel’s aging Holocaust survivors. The initiative is the only one of its kind in the country. In addition to the ceremony, the executive staff of Sheba Medical Center, led by Director General Prof. Yitshak Kreiss, distributed 5,000 memorial candles to visitors entering the facility to mark the beginning of the solemn day, in memory of the 6 million Jews who perished during the Holocaust. Prof. Dina Porat, head historian at Yad Vashem, will speak at the event, as will Mrs. Zahava Gal’al, a Holocaust survivor and longtime nurse in Sheba’s hypertension division. The ceremony will include an emotional musical interlude, and Sheba’s rabbi will say the Mourner’s Kaddish in commemoration of the six million Jewish lives that were stolen. Sheba Medical Center provides a continuum of care, from prevention to rehabilitation, and its Holocaust survivor program is tailor-made to fit each patient’s individual needs. To date, more than 900 survivors have benefited from this unique offering. Aging always takes a toll on the body, Holocaust survivors have needs that go beyond the natural issues that arise with the accumulation of years, including emotional, physical and psychological concerns that must be addressed. To meet this rising need, retired occupational healthcare professional Hilda Rejwan and Sheba Medical Center formed a partnership to create the program. The caregivers employed by the program are dedicated only to working with Holocaust survivors and are carefully trained in the specific problems that many Holocaust survivors face. The caregivers’ role encompasses everything from bathing to general companionship. When Sheba Medical Center was founded in 1948, it relied heavily upon donations from Israel’s early pioneers, many of whom were Holocaust survivors. 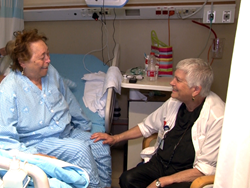 The hospital views this program as a way to give back to the people who helped create it. Since the program began, it has expanded and is now offered in the orthopedic ward, the internal medicine ward and the general surgery ward. Together, Rejwan and Sheba hope to expand it to many other departments. For aging Holocaust survivors who are suffering from long-held emotional and psychological issues, as well as physical issues, Sheba’s Holocaust survivor program has paved the way to a healthier and happier life. This project is part of a larger Holocaust remembrance effort by Sheba Medical Center. For the first time in its 70-year history, 200 members of Sheba's diverse staff will embark on a life-changing trek in late May to various Nazi concentration camps in Poland, where the participants will light 900 candles in memory of the doctors and nurses who were murdered during the Holocaust.